While better known stateside for producing awesome clothing, Millet actually got their start making backpacks. And since the company is based in Chamonix, it’s not surprising that they make ski mountaineering packs. The Tour Comp 20 is a skimo racing pack with all the features and quality you’d expect. Follow in the footsteps of Reinhold Messner, who used a Millet backpack on the first ascent of Everest without oxygen. Made with 70 denier Ultra RipStop nylon that is laser cut to perfection. 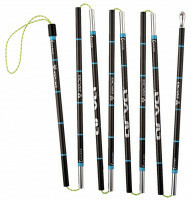 Diagonal ski-carry system with ultra-quick hook can be used with the pack on. Entire ski-carry system can be removed (-53g) for races without a booter. Ultra-aerated 3D mesh back and gilet-type shoulder straps fit like a vest. Side-access crampon compartment is padded and secured with sturdy velcro. Crampon compartment can join up with main space for bigger items. Unique Quick Axe™ ice-axe holder will hold your axe until you need it, quickly. Partner haul bungee (+18g) and an extra ski holder are a must for a mismatched team. Internal holders for a race shovel, probe, and hydration bladder (which has dual outlets). * Note the ski carry system accepts skis with tails up to ~115-120mm wide, depending on rocker. The French must be in cahoots as the pack seems to perfectly fit the Ultra shovel and Compact probe. Update 2015/16: Millet updated the colors and renamed the pack Matrix, but the functionality remains the same. Update 2016/17: The pack was renamed back to Tour Comp 20 but now is black and grey. Can you fit a Camp water bottle holder on the left shoulder strap as is? Or will you need to sew on a horizontal loop? Thanks! Hi Mada, there is a nice horizontal loop that holds the upper Velcro connector on the Action holder well, however the Millet shoulder strap is a little wide so it gets folded a bit in the lower connector. The CAMP Soft Flask holder works better since the lower connector is adjustable with Velcro as well. What color is the 14/15 model? Hi Joe, it's nearly the same, just a slightly different textured pattern on the latest edition. Check out the 2nd pic. This is your basic race pack and compares with the others out there - camp, dynafit etc BUT there are a couple of features that set this pack apart. The ski carrying system is by far the easiest to use. I've used the Trab and Camp packs for a number of years and have always struggled with the tail loop - it's awkward to reach and hold steady while trying to put your skis in. Millet solved this by putting the loop on an elastic cord so that you can actually pull the loop out away from the pack into an easier position to reach. It's simple but super effective. The tip hook is also on an elastic cord that keeps it out of the way when you don't need it. This pack is made with a heavier nylon than a couple of the other packs I've used and I think that although the overall weight might be higher the durability offsets that by far. Not only a great ski touring back, but doubles equally well for mountain bike tours. The crampon pouch access to quick items without removing the pack. Easy to remove the winter ski hook and the mesh straps and back adapt perfectly to warm temps. I am comparing the Millet Touring Comp 20 with the Camp Rapid 260 and the Dynafit Broad Peak 28. The design quality is high with the Millet as they are a backpack company, so little features like gloved sized buckles and shoulder adjustment straps that pull up towards your chin instead of away, make a big difference. Zipper on the main compartment is bigger and longer than the Camp so opening and closing and finding your stuff is much easier. I like the opening direction of the crampon compartment compared to the other packs, it feels more intuitive. I like the ice axe holder design as it is much more secure than the other two packs. The internal pockets allow for all manner of creative stuffing and packing....larger volume than the Camp model and only slightly smaller than the Dynafit. Perhaps one external mesh pocket would be a nice addition. The Millet pack fits me much better than the Camp (6'2" 193lbs) since it extends lower down the torso allowing the hip and chest straps to adjust more naturally. In sum, the Millet is a nice size and weight in between the Camp Rapid 260 ( a race pack) and the Dynafit Broad Peak ( a touring pack). I predict it will be more durable than the Camp and may even find a spot on mountain bike trips! I have just about worn out the CAMP 260 race pack and supplement with the Dynafit Broad Peak 28. 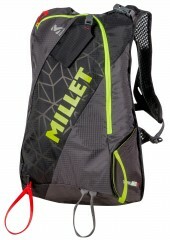 Would the Millet Comp 2o be a nice size in between, something I could use for both race/tour? How is durability? Buckle size? The Camp pack has tiny buckles, difficult to use with gloves on. I've been using this pack for some racing and light n fast tours. I chose it for the speed of the ski attachment system as the "clip" is the fastest design in the market. I've tried others by CAMP, Trab, etc, but this style for me is the fastest. It's not the most secure and that must be understood before trying to get too rad with the skis attached. Overall, it's a high performance pack that does exactly what it's supposed to do. Oh, it's also a little more spacious than most other race packs which is nice for daily touring. Can you describe or show a better picture of the ski shoulder attachment? I don't see a hook in the photo. Interested to see how this works. Also, can Dynafit water bottle holders be sold separately to use with this pack? Hi Carl, I posted a couple pictures for you. The arrangement and lighting don't do justice to the quality of the pack, but it should help answer your questions. The hook is similar to the Dynafit system: slide your tails through the red loop on the bottom and extend the metal hook over your shoulder to secure the skis. The pictures show the hook stowed in the shoulder strap, but it's on an elastic cord that stretches up to grab the skis. The strong elastic cord retracts back into place when you're done with it, so you don't have to fumble around looking for the hook on subsequent booters as with some other packs. This pack doesn't take a water bottle as nicely as say the Dynafit RC packs do. The two reflective strips on the shoulder straps in the above picture sit up high on your collar bone. I had a crossbar piece of webbing stitched to the left shoulder strap (as it's being worn) lower down so I could strap a water bottle holder to it. That said...if it's below like 20, I put the water bottle inside my suit. I've been burned by a frozen water bottle more than I care to admit.